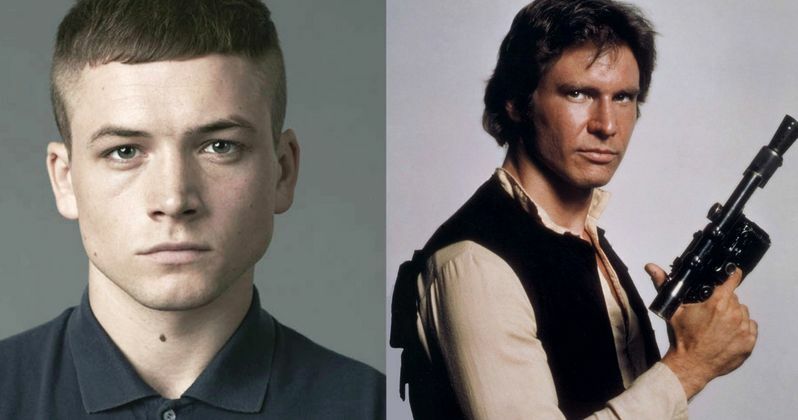 Star Wars Spinoff Wants Kingsman Star as Han Solo? The Untitled Gareth Edwards Directed Star Wars Spin-Off is expected to start shooting in the coming months, as we head into spring. The film will reportedly overlap with Spectre shooting at London's Pinewood Studios sometime in late March or early April. Which means an official casting announcement should be made soon. In the meantime, we have a new rumor that reportedly already knows who will play a young Han Solo in this first standalone adventure. If we're to believe The Sun, it will be Kingsman: The Secret Service breakout star Taron Egerton. Gary Whitta wrote the first draft of the Untitled Gareth Edwards Directed Star Wars Spin-Off, with Chris Weitz coming on for a new draft. No story details have been revealed, and the rumors regarding the plot have been a little erratic. Way back when these spinoffs where first announced, it was believed that the first would follow Han Solo, while the second would follow bounty hunter Boba Fett. It was later said that this particular movie would include both Han Solo and Boba Fett, with a story that focused on a young Han as he teams up with a group of space pirates. There have also been reports that the story will follow a group of spies who steal the plans to the Death Star. The Sun goes back to earlier claims that this is Han Solo's origin story. They go onto say that this film will show "how Harrison Ford's iconic character got the Millennium Falcon, as well as showing how he fell out with Jabba the Hutt." It was previously reported that Orphan Black star Tatiana Maslany had won the lead female role in the spinoff. She was later said to be playing Mandalorian weapons expert Sabine Wren, one of the main characters on the animated Star Wars Rebels series. These rumors seemed to disappear once it was announced in the trades that Felicity Jones had actually won the female lead. That has never been confirmed by Disney nor LucasFilm.